Ever heard of Joyce Weisbecker? If not, you’ll probably hear her name a lot in the future — at least in video game history. 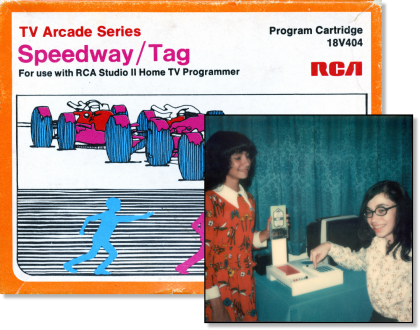 FastCompany just published an article I wrote about Weisbecker, who was probably the world’s first female professional video game developer, predating the work of Carol Shaw by several years. In 1976, Weisbecker created two games for the RCA Studio II console (released Jan 1977), which was based on her father’s home computer architecture. Her story is fascinating, and I had a lot of fun bringing it to light. I hope you enjoy it. By the way, if you enjoy seeing this kind of work from me, please consider supporting me on Patreon. At this point, Patreon support is absolutely essential to what I do. There are many more stories like this out there, including some I know about already, but they will never be developed without financial support. This entry was posted on Friday, October 27th, 2017 at 10:54 am	and is filed under Computer Games, Computer History, Gaming History, Retrogaming, Vintage Computing. You can follow any responses to this entry through the RSS 2.0 feed. You can skip to the end and leave a response. Pinging is currently not allowed. Not only was she likely the first female game programmer, but it was likely the first father/daughter team in computer history. At least that I know of. The picture is actually System/00 which was a TTL prototype built by Joe W which is functionally very similar to Fred. Fred used the 1801 when they became available – Fred II appears to have had a limited run of about 20 machines (this is what Joyce is using in the picture). From memory, Joyce is credited with some of the games that ran on FRED as well. These look entirely different to Elf / Studio II / VIP – it was (normally) a 32×32 array of dots each seperated by a space of the same size. Unlike the later machines, the 1802 had almost nothing to do with its operation. She’s actually wrong about the resolution being the problem. You can do games in 64×32 that are quite playable and don’t look too bad, and an S2 could also do 64×48 which is much better. The problem is the CPU speed. The 1802 spends about half its time producing the video, and its slow to begin with (say about a factor of 4-5 compared to an equivalent 6502. Joyce was also writing in Chip-8 (or its S2 variant, or FEL-1 the Fred version – they’re all fairly similar) which adds an interpretive level to the CPU that slows it down again. This is why the non m/c S2 games run like paint drying. Game writing for the 1802 you do backwards, almost, the first thing you do is to write the basic screen renderer so that it can generate code fast enough. And you pretty much have to do it in machine code. Paul, thanks for that info… surprised that no one has responded to your comments. Paul, what you described sounds a lot like Atari 2600 programming. You create the kernal, making sure that your video output actually works, and then you keep adding features and stop when you run out of time or you break your video display.